50 Ohm 35 Watts. Type N male connector 0-1000 MHz. Type N male connecter. Can be mounted directly on your wattmeter. Compact, rugged, DC-1000 MHz. 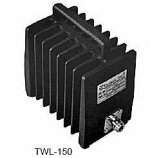 Use the TWL-50 for higher frequencies. Uses quck change connectors. 50 Watts continuous to 2500 MHz. Type N male is standard. Specify connector type if other than type N male. Compact and rugged, connects directly to your wattmeter. Uses quick change connectors, Type M Male. Conservatively rated 75 Watts continuous to 2500 MHz. Type N male is standard. Specify connector type if other than type N male. Compact and rugged, connects directly to your wattmeter. Used in excellent condition. Uses quick change connectors. 75 Watts continuous to 2500 MHz. Type N male is standard. Specify connector type if other than type N male. Compact and rugged, connects directly to your wattmeter. Uses quick change connectors. 100 Watts continuous to 2500 MHz. Type N male is standard. Specify connector type if other than type N male. Compact and rugged, connects directly to your wattmeter. Uses quick change connectors. Conservatively rated 100 Watts continuous to 2500 MHz. Type N male is standard. Specify connector type if other than type N male. Compact and rugged, connects directly to your wattmeter. Used in excellent condition. Coaxial dry RF load, 150 watts, 0-2500 MHz, bench RF load. Coaxial dry 50 Ohm bench RF load. Type N female connector. 150 Watts 0-2500 MHz. Used in excellent condition. Coaxial dry RF load, 300 watts, 0-2500 MHz, bench RF load. Connector N(F) QC.